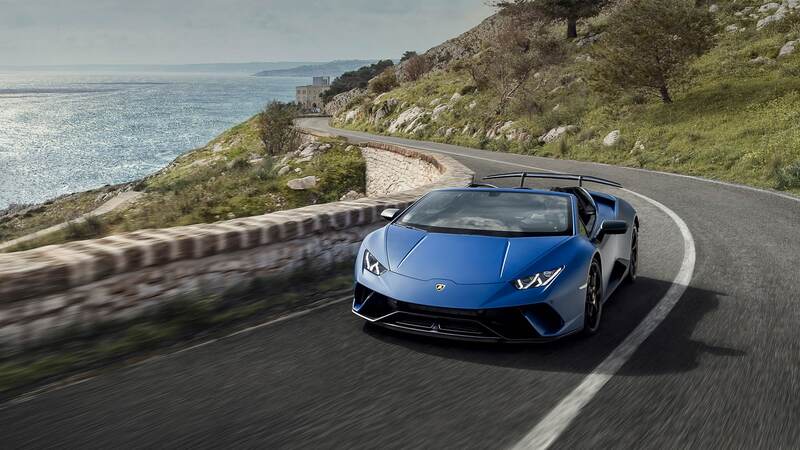 A blue Huracán Performante Spyder captured on a curve in a road along a rocky cliff. A blue Huracán Performante Spyder racing down the road, as seen from above. The Huracán Performante has decided to lower its roof and transform itself into the Spyder with the highest performance that the Huracán family has ever seen. Its lines are designed to thrill at first sight and its state-of-the-art technology has been developed to provide a one-of-a-kind driving experience. Weighing in at 35 kg less than the Huracán 4WD Spyder and with 30 HP more, this newest addition to the House of the Raging Bull vaunts the best power-to-weight ratio in the Huracán Spyder range. It uses Forged Composites® material and the new ALA (Lamborghini Active Aerodynamics) technology. The Huracán Performante Spyder: power has become breathtakingly beautiful. A side view of blue Huracán Performante Spyder against the backdrop of a cliff. It would be impossible not to feel the thrill. The Huracán Performante Spyder is breathtaking beauty paired with extreme performance. A car with a strong and assertive character, designed to enrapture. With an ANIMA driving-mode selector that has been optimized to respond seamlessly to driver commands and its V10 640 HP Huracán Performante Spyder engine, the sensations you experience behind its wheel will travel from your head to your heart in a fraction of a second. Design and aerodynamics developed with a passion that comes only from striving to attain the very highest in performance and beauty, and achieved thanks to the use of Forged Composites®, a hybrid chassis in aluminum and carbon fiber, and the new patented Lamborghini ALA (Lamborghini Active Aerodynamics) technology. Its sharp, clean and finely-honed lines make the Huracán Performante Spyder unmistakable. All of the Italian luxury and elegance of a Lamborghini can be found inside this vehicle. The details are finished with care, devotion and precision. Elegantly concealed within each individual component of the Huracán Performante Spyder lies the most state-of-the-art technology. Take, for instance, the ANIMA (Adaptive Network Intelligence Management) driving-mode selector, which makes it possible to satisfy every driving need and allow this vehicle's character to shine under any conditions. There are many aspects that make this vehicle the highest expression of the new concept of super sports car. The even more powerful V10 engine, the extensive use of Forged Composites®, which make it even lighter in weight, the LDF 7-speed dual-clutch transmission and the new ALA active aerodynamic system that controls the air and directs it in its favor. Completely updated and redesigned, with fluid-dynamics optimized at both intake and exhaust, this engine is the aspirated V10 with the highest specific power. The new intake ducts come directly from Lamborghini Motorsport’s experience and improve response at all speeds. The double clutch transmission (LDF) has been further perfected and now is able to support even the highest performance. All of this is captured by the even more vibrant and thrilling sound of the new lightened exhaust system. Aerodinamica Lamborghini Attiva is an intelligent and innovative system that manages active aerodynamics. The ALA system adapts to the driving style and type of route. When necessary, it increases vertical load to promote stability and speed through curves or reduces aerodynamic resistance to promote acceleration and make it easier to reach top speed. The double wishbone architecture of the Huracán Performante Spyder’s suspension systems guarantees the perfect balance between ease of use and sports performance. The standard suspension is paired with an optional system of magnetorheological shock absorbers that instantaneously respond to driving style and adapt to road conditions and driving dynamics, improving control over the vehicle, especially on the race track. The Huracán Performante Spyder is equipped with Electronic Power Steering (EPS), a system that adapts perfectly to any driving style and always ensures the right power assistance on both track and road and in every ANIMA driving mode. The innovative Lamborghini Dynamic Steering (LDS) system is also available as an option. It lets you dynamically change the steering ratio, especially in CORSA mode, to get a more direct response on the race track. Imagine you could have two gearboxes in the same unit: while one gear is engaged, the next would already be selected to reduce shifting time and be sure the shift occurs instantaneously and in the smoothest way possible, by opening one clutch and closing the other. This is what the Huracán Performante Spyder is able to offer you, thanks to its 7-speed Lamborghini Doppia Frizione (LDF) dual-clutch transmission. Even the new main instrument panel graphics of the Huracán Performante Spyder convey a sense of performance and speed. In CORSA mode, the tachometer and gear indicator are clearly visible in the center, just like on a race car. The Lamborghini Smartphone Interface (Apple Car Play©, Android Auto©) and the Lamborghini Telemetry System are also available as optional equipment. With CarPlay, you can pair your iPhone to the car and display the main personal apps that are available directly on the instrument panel. With the Lamborghini Telemetry System, on the other hand, you can record your performance in real time and analyze it afterwards to improve your driving skills. The all-wheel-drive system is controlled electronically and guarantees greater speed and precision in transferring torque between the axles. All of this translates into improved control in any driving conditions. The system continuously varies torque distribution on the basis of the selected driving mode and the road conditions. The result is exhilarating: improved power transfer on curves and when accelerating during demanding stretches of driving, together with better grip and safety during day-to-day driving. One of the secrets behind the new Huracán Performante Spyder’s performance is Forged Composites®. It is the lightest, most resistant and cutting-edge material that Automobili Lamborghini uses today, and it makes it possible to create the components with complex geometries that are at the heart of the front and rear structures of the ALA. Discover all of the possibilities for customizing your Huracán Performante Spyder. We think you should be able to choose the vehicle of your dreams. That’s why we provide a range of colors for the exterior, the interior, the stitching, cockpit materials and brake calipers. The combinations are practically infinite and they allow you to create a unique car, always with pure Italian style. Your Lamborghini Dealer will be able to advise you on all of the available customization options, so that your car matches your needs and, most importantly, your personality.